The struggle with balancing creative products that are innovative, technically feasible, and financially sound is one designers and web professionals go through every day. The Design Studio Method is a creative problem solving process that allows you to quickly generate ideas, evaluate them, and reach consensus, achieving that balancing act. 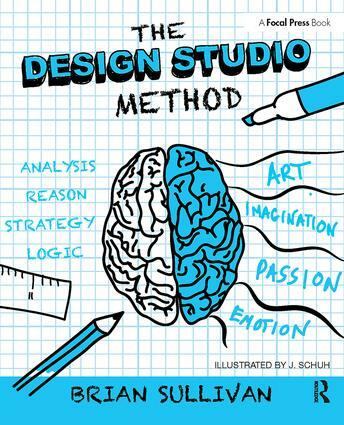 Brian Sullivan’s The Design Studio Method gives answers that you have been looking for, showing you how to be innovative and efficient without sacrificing quality and collaboration. This book simplifies the complicated method, explaining each step, each participant’s involvement, and how to adapt the method to your needs. The Design Studio Method provides step-by-step procedures to ensure your success. From illumination, to generation, to presentation, all the way to iteration, this book provides the road map you’ll need to start generating innovate products. Shows you how to involve all members of the creative process—from clients to directors—so that everyone participates, critiques, and innovates. Features real-world examples of Design Studio projects that highlight the successes of this method and ways to adapt it to your needs. Includes a website that showcases videos covering each step of the method and other procedures that crop up along the way.